My introduction of the Chameleon Necklace collaborating with the IOD (City) and the Women in the Livery. The sponsoring peer was Baroness Sue Garden. The Christmas Party was a delightful evening at the House of Lords. 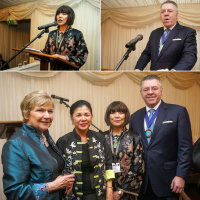 Speeches were made by Baroness Garden, IOD city chairman David Stringer Lamarre and Mei Sim Lai OBE, DL representing the Women of Livery and lastly me. Gosh I was very nervous but managed to pull it through. For those not there, this was my speech. I add my welcome to you all and to thank Baroness Garden for being our Sponsoring Peer this evening. I am a Jewellery Designer and my business is Lifestylewithfrends.com. LifestylewithFriends.com is my third career. As the saying goes, third time lucky. I started out as a teacher having won a scholarship. Once I paid back my dues I curtailed my teaching career to pursue my passion for design in London. I graduated top of the class from the London College of Fashion and found myself designing for a very niche group of people especially the American market. And counted amongst my clients Barbara Streisand and the late Lauren Bacall. After many enjoyable years in fashion, personal circumstance forced me to take a break from fashion. There I would have remained had it not been for the persistent call to return to producing creative work again, by my most loyal clients and supporters. This time I was drawn to take the world of jewellery. I relish thinking outside the box. Bringing years of experience in fashion to bear on creating my designs which had not been done in jewellery before. There were a lot of hurdles and preconceptions to overcome. But I am very proud today to be able to bring the Chameleon Necklace to the market place and all the other designs that it gave birth to. For centuries the orient has been renowned for its exquisite handcraft jade pieces. Drawing inspiration from my Chinese heritage, I make it my mission to bring these into the 21st century by giving it a modern twist. This is the world’s first fashion forward necklace with catwalk calibre. And above all I am truly blessed to be able to join with Women in the Livery and IoD City for this Christmas Celebration event.